I'll be straight forward, Zombie is a highly disturbing book to read. Not only is the subject matter disturbing (this isn't about your typical zombie, but that's all I'm saying about that. Spoilers! 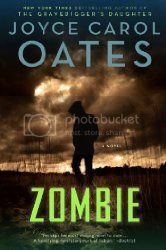 ), but Oates' writing from the view point of the main character is equally disturbing. You see, her main character is a serial killer sexual deviant psychopath, and there is nothing in the book that is even remotely uplifting. We are witness to his thoughts and his actions, while also seeing how he portrays himself to the rest of the world. The book is a disturbing look into the mind of a very dangerous, sick person, and I don't know that I'd recommend this book for anyone unless you have a strong disposition. Saying all that, I think the book is fascinating. As a character study, Oates does an amazing job, but she also makes sure that she never sugar coats her character to try to make people feel for him. No, by the end of the book, I didn't have any emotion other than repulsion about the character. I honestly can't get away from the word disturbing when I try to think of another way to describe, the book, the character, the writing style... it is simply disturbing. I've never experienced Oates' writing before, and even though the nature of this book isn't something that I would read on a day to day basis, I think I'd be interested in reading more from her in the future.